What a gift it is for an actor to possess truly corrupt features – shifty eyes, a built-in sneer, the jowls hanging heavy with bitter experience. A long career is far more attainable for the villain than it is for the pretty boy or the action hero. Harris Yulin is one so blessed, a go-to sleazeball for casting agents, that hangdog frown perfectly lending itself to the part of nefarious authority figure (Clear and Present Danger, Scarface, Ghostbusters II), and finding constant employment in TV. Harris was everywhere in the early 90s, so it was perfectly natural that he should have cropped up in Star Trek: Deep Space Nine – the show that my brother assures me is the best Star Trek series (if not the best SciFi TV show) ever made. Until last night the show had failed to deliver. The dialogue seems generally of a slightly higher standard than the average Trek fare, and the space station/ wormhole setting offers interesting alternatives to Starship planet-hopping. Odo and Quark’s relationship is good fun (though their ‘grudging respect’ is established too early) and Avery Brooks’ bizarre delivery is a thing of wonder; but in other ways it was frustrating in a familiar way. Some key casting seems like outright sabotage, and the stories were often standard clunk-fests, with one episode (The Storyteller) bringing on an impromptu snooze. Then Harris turned up in Duet, and an almighty click echoed through the promenade: Peter Allen Fields conjures a proper story out of the Bajoran occupation/ resistance, and finally begins fleshing out Major Kira’s character. 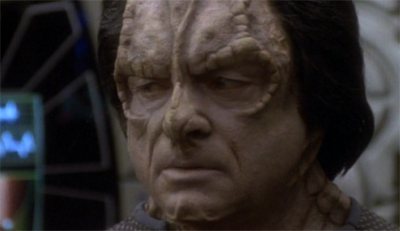 Odo Bloodhounds about the place, sifting through the ash of Cardassian occupation, Gul Dukat gets an outing, and Harris’ character finally lends DS9 a sense of time and place: the centre of a fragile peace, built on shifting piles of bones. Harris really lets rip. His characters’ gleeful admission of responsibility for his crimes doesn’t clunk like a can of ham, as so many Star Trek guest appearances do; that’s because, like all great SciFi, it has the stench of the real, something that transcends the daft makeup. It’s a surprise all that facial augmentation doesn’t melt off, so hot does the sneer burn with defiance and bloodlust. Broadcast at the time of the Bosnian civil war, talk of camps and ethnic cleansing might have seemed brave enough: to weave in complex questions about the limits of the just cause, and the possibility of good men existing within bestial regimes, is something else besides. Duet stopped DS9 drifting to its certain destruction. Let’s see if Season 2 can restore power.